In 2018, the New York Giants‘ defense was one of the worst in the NFL. They allowed 25.8 points per game which ranked 23rd in the league. They were poor against both the run and the pass. Against the run, the Giants ranked 20th with 118.6 yards per game. And against the pass, the Giants ranked 23rd with 252.8 yards per game. The Giants’ only two Pro Bowlers on defense from 2018 are no longer with the team. Landon Collins left for Washington in free agency and Olivier Vernon was traded to Cleveland. This left the Giants’ defense filled with holes and lacking any star talent. Despite this, the Giants still have the opportunity to vastly improve on defense in 2019 through the NFL Draft. The Giants hold two 1st round picks in the 2019 NFL Draft. This opens up plenty of defensive options for the Giants. Luckily for the Giants, the 2019 draft class is absolutely loaded with defensive talent. With the 6th pick, the Giants have a good chance of drafting an elite defensive prospect. With the 17th pick, the prospect might not be “elite,” but he will be good enough to start and make an immediate impact for Big Blue. On Monday, the Giants met with two defensive prospects who both have the chance to be drafted by the Giants in the 1st round. The two defensive prospects the Giants met with are Ed Oliver and Clelin Ferrell. Oliver is an option for the Giants with the 6th pick and Ferrell is an option for the Giants with the 17th pick. Ed Oliver is an interior defensive lineman who has extreme athleticism and the ability to defend the run, as well as rush the passer. Oliver has drawn some comparisons to the NFL’s best player, Aaron Donald. This is because both Donald and Oliver possess rare athleticism for their size and position. Oliver is only 6 feet 2 inches and 287 pounds. This is undersized for his position, but it allows him to be an extraordinary athlete. At his Pro Day, Oliver ran a speedy 4.71s 40-yard dash. This is certainly comparable to Donald’s 4.68s. Oliver showed off elite quickness, running a quicker short shuttle than Donald with a time of 4.22s. That time is quicker than Saquon Barkley’s! Ed Oliver running a 4.19 shuttle at Houston’s pro day is WILD. But when you watch the tape and stuff like this, it's not exactly unexpected either. 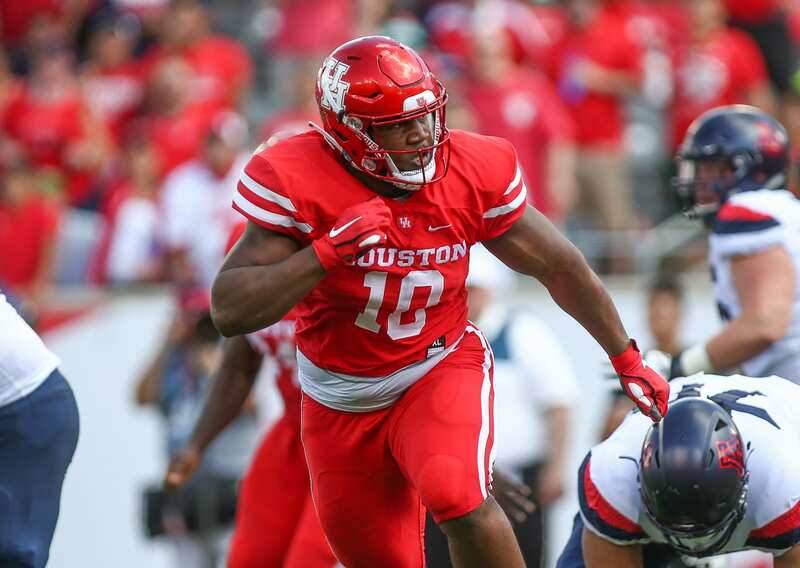 In his collegiate career at Houston, Ed Oliver was a little bit up and down. Many analysts attribute this to Oliver being used incorrectly in Houston’s new defensive scheme in 2018. Prior to 2018, Oliver was looked at as a lock for the top 3 picks in the draft. His 2017 season was impressive, as he recorded 73 total tackles, 16.5 tackles for loss, and 5.5 sacks. Ed Oliver would instantly make the Giants’ defense better for years to come. Clelin Ferrell is an edge defender out of Clemson’s loaded defense. Ferrell played a big part in Clemson’s 2018 National Championship season. In 2018, Clelin had 55 tackles, 20 tackles for loss, and 11.5 sacks. Outstanding production by the junior edge defender. If the Giants could combine Ferrell’s pass-rushing ability off the edge with Oliver’s all-around dominance on the inside, they could create a scary defensive duo for years to come. Adding this pair in a mix that already features Lorenzo Carter, Dalvin Tomlinson, and B.J. Hill gives the Giants potential to have one of the best, young defensive fronts in the NFL. New York Giants: Is Dwayne Haskins a Possibility With the No. 17 Overall Pick?